As part of AMD's GDC 2016 keynote, the company has announced a brand new graphics card: the long-awaited Radeon Pro Duo with what appears to be two Fury-class Fiji GPUs on the one board. The press release for the Radeon Pro Duo is a bit light on details, but everything does point to this card being the rumored "Radeon R9 Fury X2." Instead of slotting this card into the Fury line, AMD is positioning it as the "most powerful platform for virtual reality", allowing users to both create and consume VR content on this dual-GPU solution. 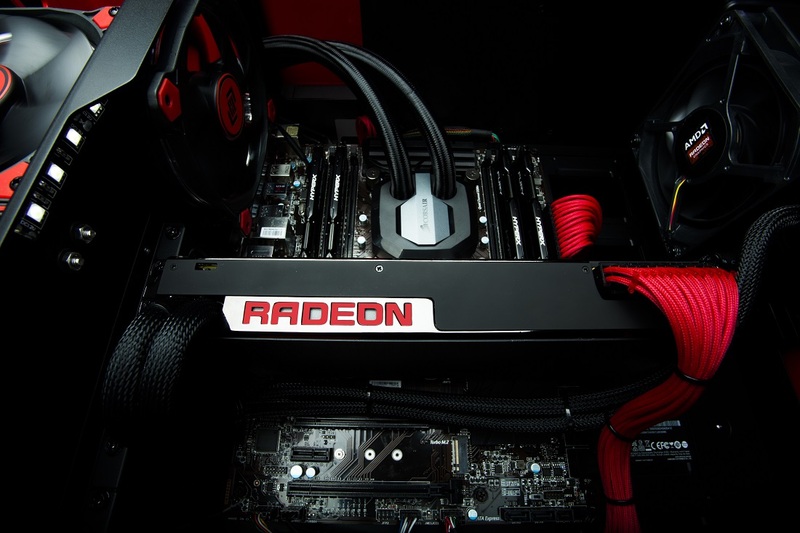 What AMD has revealed is that the Radeon Pro Duo is capable of 16 TFLOPS of compute performance, which is around double that of the Radeon R9 Nano. This graphics card is designed to be heavily used alongside AMD's LiquidVR technology, which helps optimize VR games and content for AMD's GPU architectures to ensure the best experience. 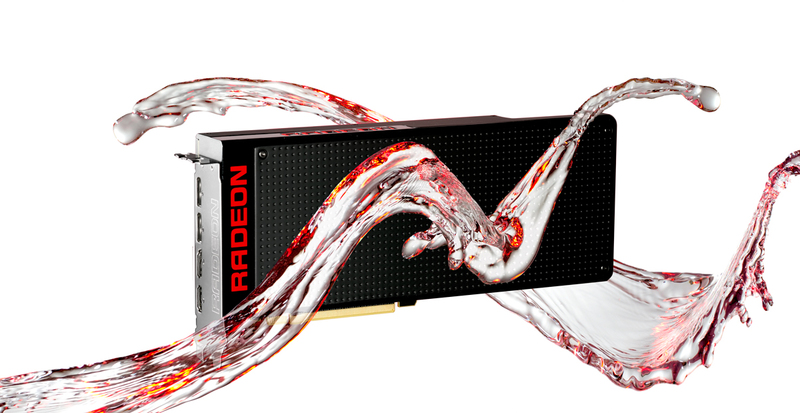 Judging by images of the graphics card, the Radeon Pro Duo uses a closed-loop liquid cooling solution similar to the R9 Fury X, but in a card that's much longer to accommodate both GPUs. You'll also notice the card requires three eight-pin PCIe power connectors, while the I/O shield includes two DisplayPorts and two HDMI ports. The Radeon Pro Duo is also the first product in AMD's new 'VR Ready Creator' line, and it's a key piece of hardware in Crytek's new VR First initiative that aims to bring VR development on CryEngine to colleges and universities through dedicated VR labs. AMD is a major partner in Crytek's VR First program, and any new labs will be equipped with Radeon Pro Duos. If you're thinking about buying the Radeon Pro Duo, it won't be cheap: AMD has listed a price of $1,499 for this graphics card when it becomes available in Q2 2016. This is the very same price as the Radeon R9 295X2 from the previous generation, and it comes in at around $200 more than buying two standalone Radeon R9 Fury X cards and running them in Crossfire. As for AMD's other VR initiatives, the company has announced the "VR Ready Premium" designation that's designed to make it easier for consumers to pick a graphics card that is capable of running VR games. The label will apply to all "certified" Radeon R9 290-class GPUs and higher, as well as any systems that are built using these cards, such as HP's Envy Phoenix. The "VR Ready Creator" designation, which only applies to the Radeon Pro Duo at this stage, is meant to designate "unprecedented performance and industry-leading innovation" to assist with the development of VR content along with regular VR consumption. We're still waiting on more information about the Radeon Pro Duo, so we'll update this post as AMD's GDC keynote gets underway. How much RAM does this card have? The press release for the Radeon Pro Duo is a bit light on details, but everything does point to this card being the rumored "Radeon R9 Fury X2." If AMD isn't excited enough to share, then this is not good. 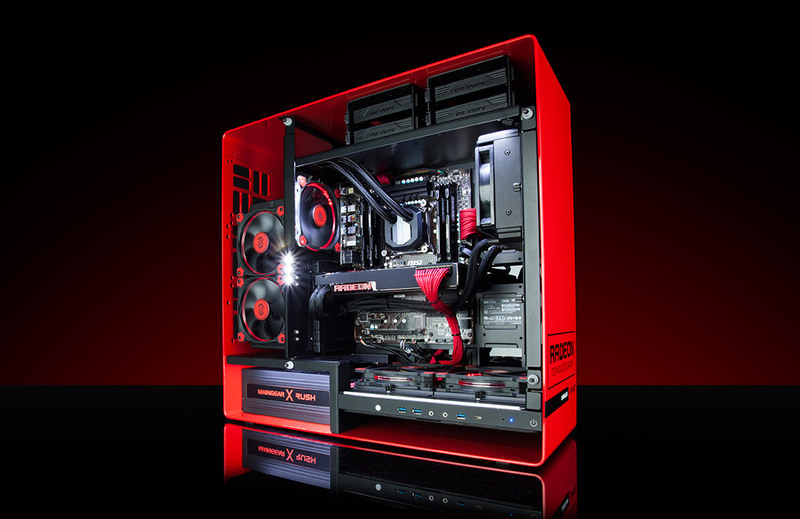 AMD has listed a price of $1,499 for this graphics card when it becomes available in Q2 2016. Q2? Q2?! This is certainly not good. It's Fiji, so 4GB HBM 1.0 per GPU. Seems like "only" 4GB of HBM could be a limiting factor for such a high end card. It is primarily a piece of kit for VR developers - so more of a prosumer segment bridging consumer and professional segments. I don't think the card is being marketed for gamers (although it wouldn't surprise me if AIB's like Asus took the opportunity to do so in some guise), more a compact single solution for a one-GPU-per- VR screen developer. Price wise, it wouldn't stack up well against two FuryX/Fury/Nano in a gaming comparison, but I'm betting gamers won't be the primary marketing focus. Well, Q1 ends in just over 2 weeks... so Q2 would be April to June.... You DO realize it's March 15th now, right? This is a $1500 card, so don't expect it to sell crazy numbers - it makes the Titan X look cheap!! So how many streaming cores does this beast have? This is also a prosumer card. So comparing price with consumer card won't apply. it has 2x4 gigs of HBM memory as it is x2 gpus so this card should be pretty awesome.